The port of Mitarai, as seen in a c. 1904 photograph, on display at the Wakaebisu-ya in Mitarai. After a bit of a drive from Shimo-Kamagari, past sea shores and mountains of lemon & mikan, we arrived in the old port town of Mitarai. 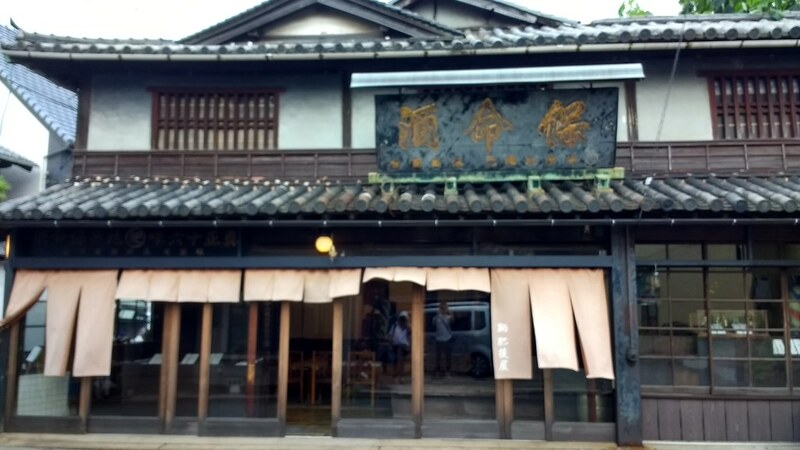 Even more so than Kamagari, Mitarai is fitted out as a tourist town – with a welcome center, tourist walking maps posted here and there, traditional-style inns, and so forth. Walking through narrow streets of traditional homes, we made our way to the Buddhist temple Manshû-ji. Surrounded by high stone walls, it seems like a fairly major site, but once you get inside, there’s actually not much there. Looks abandoned, even. 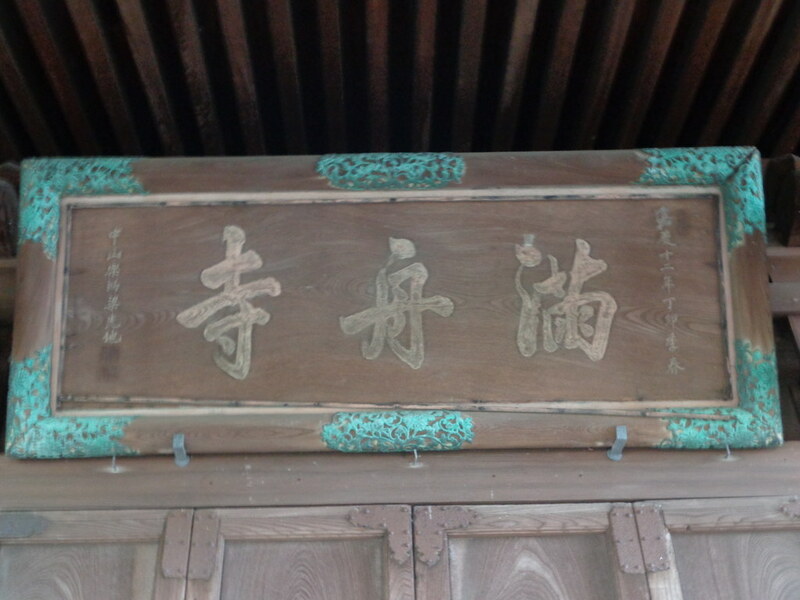 But, hanging over one small secondary worship hall we found what we were looking for – a wooden plaque, reading simply the name of the temple, Manshû-ji, but written in the handwriting of a Ryukyuan ambassador, Tôma peechin Ryô Kôchi, from 1806. 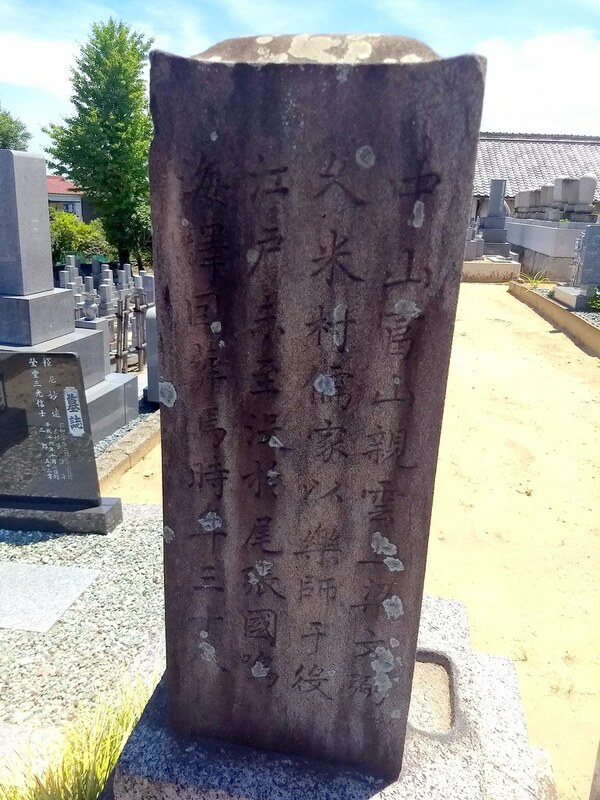 The Japanese poet Kurita Chodô, who arranged for the plaque to be made, is buried at Manshûji, but we weren’t able to go looking for his grave – the graveyard areas of the temple were blocked off-limits, and very little was well-maintained at all (high grasses, no path). 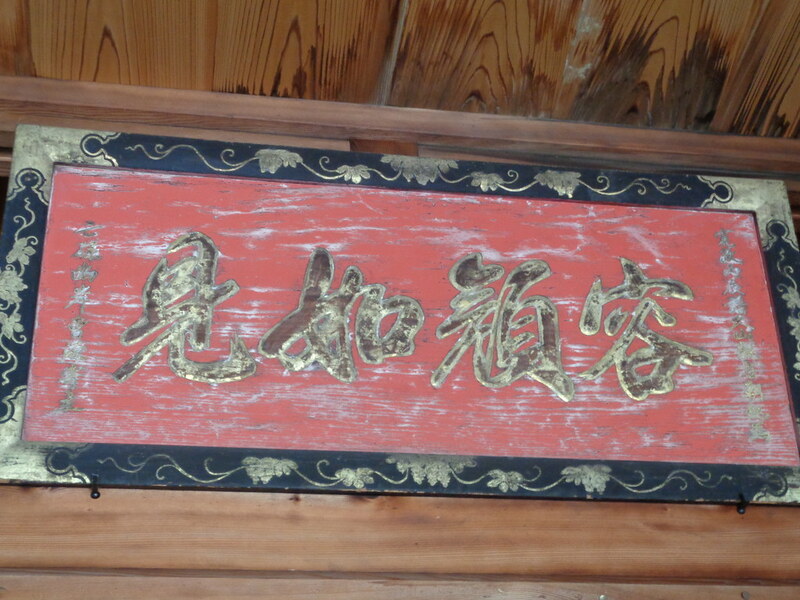 A wooden plaque hanging at the Buddhist temple Manshû-ji, copying the calligraphy of Ryukyuan scholar-aristocrat Tôma peechin Ryô Kôchi. The small hall at Manshû-ji over which the plaque hangs. I thought it kind of incredible that the plaque is still kept there, in this place of honor, rather than having made its way to some storehouse or museum. While I worry about the conservation issues, it’s also wonderful to see it in context, in its “correct” historical place. 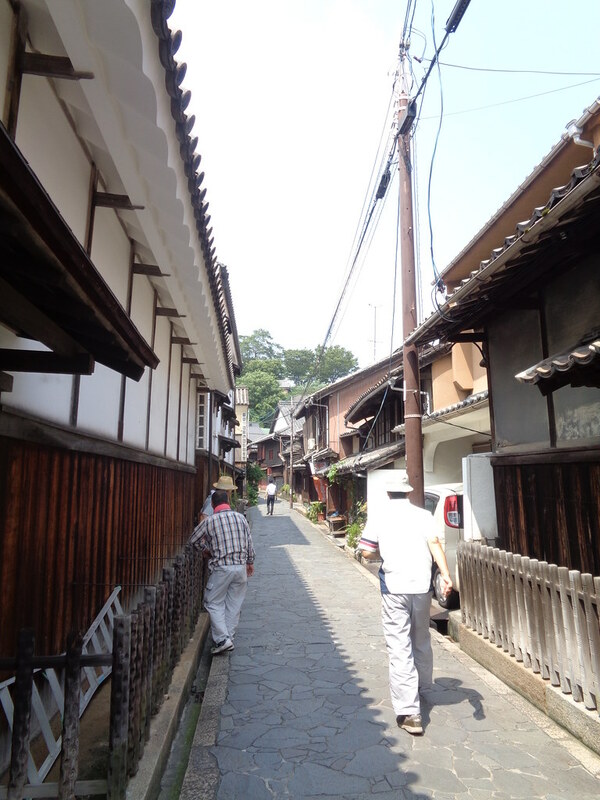 We then took a set of steps down back into town, into what I suppose is the main touristy/historical stretch. 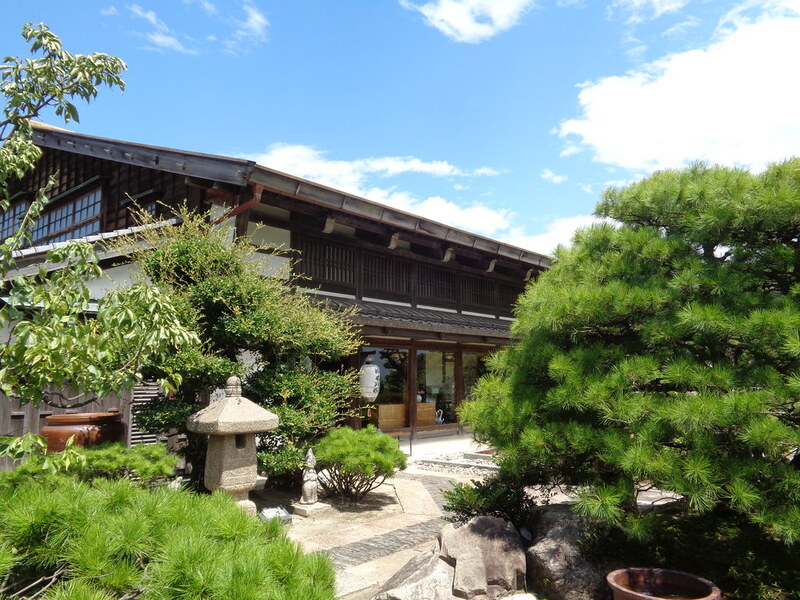 A renovated 100-year-old building converted into a hip youth hostel, a former inn for Ryukyuans and others associated with the Shimazu now operating as an art gallery, and so forth. The Shiomachi (“Waiting for Tides”) Visitors’ Center doubles as a café, specializing in shave ice, and similarly has this sort of young, youth hip travelers’ sort of vibe. 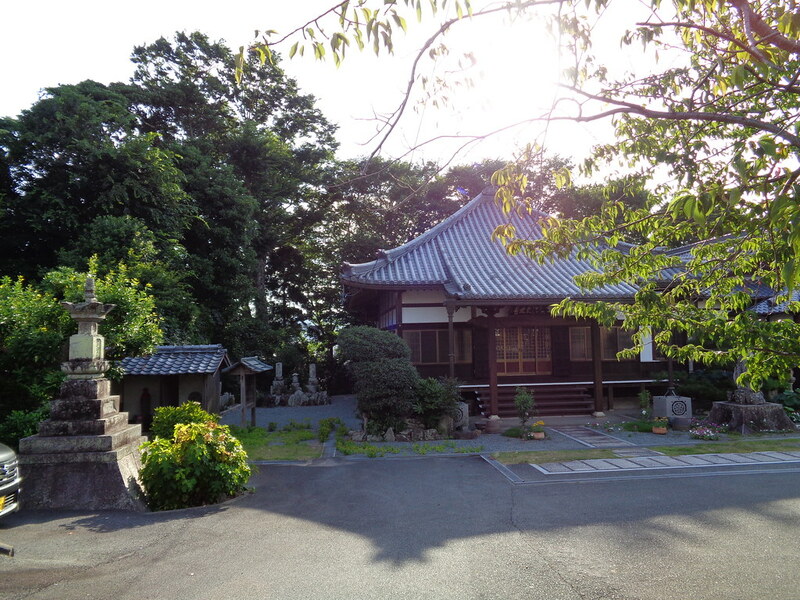 One of the old buildings in the area, the Waka-ebisu-ya, was once an Edo period brothel. Many of these ports presumably had their share of “courtesans,” or “women of pleasure,” to cater to the various elites + merchants who came through, but we saw no mention or evidence of this in the other towns. By contrast, Mitarai is somewhat famous for having that history, and indeed Amy Stanley devotes a chapter to Mitarai in her excellent book on Edo period prostitution, Selling Women. I find it a little hard to believe, but according to some things I read, it seems like as much as 1/5 of the town’s population at times were courtesans. The building is maintained today seemingly as just an open space, presumably used by the community for various community events and activities – I noticed several mikoshi (portable shrines, for use in local festivals) and other such things stored atop a small stage, or in the backstage area. The space is otherwise just open and bare, albeit with a number of photographs and framed copies of documents or the like hung on the walls, explaining the history of the brothel and of the town. 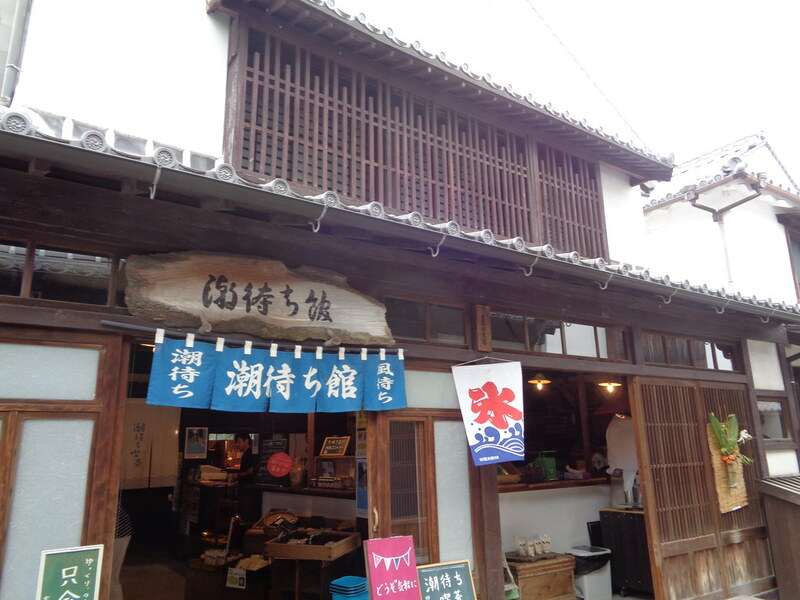 The Shiomachi-kan Visitors’ Center / Shave Ice Cafe. 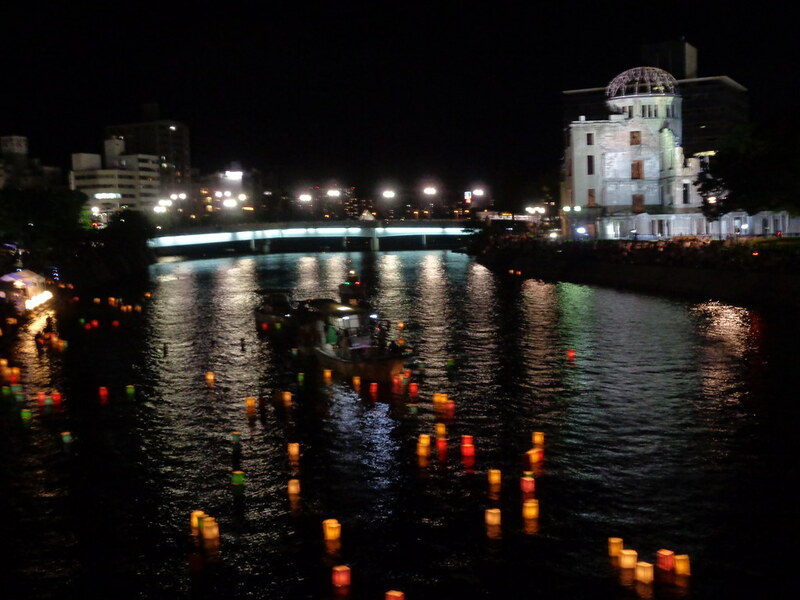 That night, we went into Hiroshima City proper, for the Lantern Floating Ceremony, the last of the major memorial events of the day. I’m not even sure what to say about this. It was quite a change of mood, and mode, to go from thinking about early modern port towns, and inns and merchants and traditional architecture, to this site of modern, international, war remembrance. I don’t know how many thousands and thousands and thousands of people were gathered in the Hiroshima Peace Park that night. We waited on a line that snaked around and around and around, far longer than we’d imagined possible, to wait for our turn to lay our paper lanterns in the river, sending messages of peace and of memory, to speak to the spirits of the dead. A small group of Okinawan high school students were there, interviewing people – Japanese and foreigners alike – as to their thoughts and feelings about “peace,” and teaching them about the Battle of Okinawa. This was my second time in Hiroshima – my second time being there on Aug 6 – and my first time experiencing or taking part in any of the memorial events. I am glad, as a Japan specialist, and as an American, and just as a human being, to take part, to witness it, and to be able to say that I’ve done so. A 1/10th size scale model of the battleship Yamato, at the Yamato Museum in Kure. The next day, a typhoon hit (though it was actually not nearly as bad as expected), and so we stayed close to “home,” and spent the day in Kure City proper. In the Edo period, Kure was just a grouping of small villages – obviously, every place has its history, I won’t say those villages have no history, but, insofar as looking around for any notable historical sites or anything, as far as that sort of thing goes, Kure’s history begins, basically, in the Meiji period, the late 19th century, when it became a major center for the Imperial Japanese Navy. 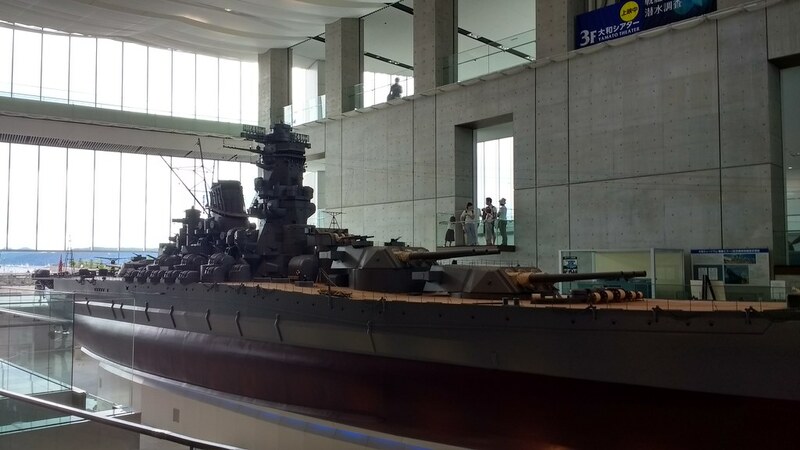 We visited the Yamato Museum – a museum dedicated to the naval history of Kure, and especially to the story of the Battleship Yamato, one of the heaviest battleships ever built, which was built here, in Kure. The berths where it was built are visible just outside the museum. I’ve never been that much of a military buff, and I don’t know quite that much about military history… the museum was an interesting combination of military buff sort of history, and a sad story about the lives lost when the Yamato was sunk – and the impacts upon families, and the city, back home. I didn’t read things closely enough to be able to really comment on precisely how the museum addresses the issues of militarism and imperialism; there’s certainly an interesting conversation to be had about how we memorialize those killed in battle – who did die, and who did have families, and who were the core of the community of this city – who deserve, arguably, to be remembered sympathetically, but then again, who died in service to imperialism and ultra-nationalism and so forth. I’m not expert at such things, but a friend who is, says this is one of the best museums in that respect – sometime I’ll have to maybe ask him for more detail on what he means there. 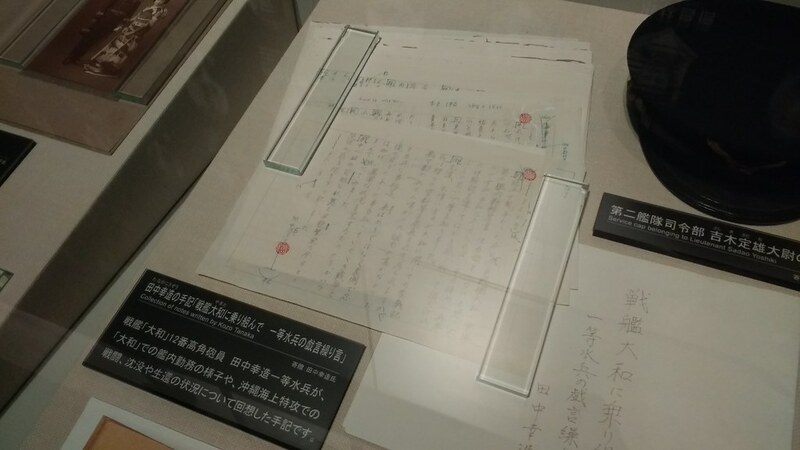 A sailor’s notes, recording his thoughts regarding the Yamato’s Okinawa mission. 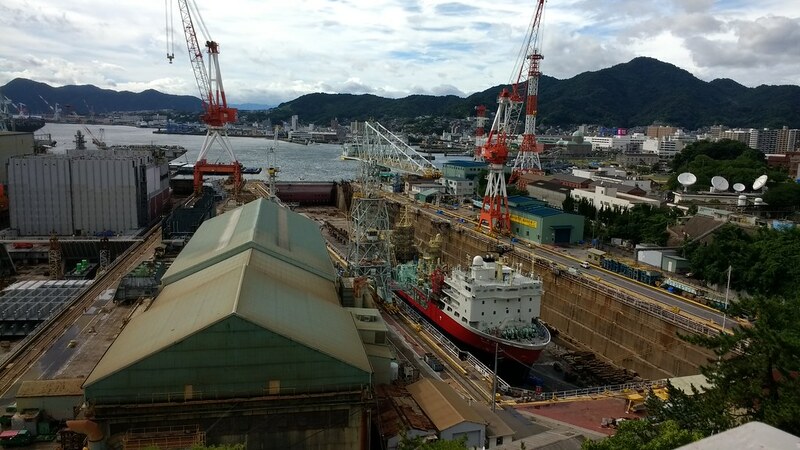 The Naval Shipyards at Kure. I believe that much of what we’re seeing here is civilian/commercial use today, but the Japan Maritime Self-Defense Forces uses a considerable portion of land and harbor just to the right of that. 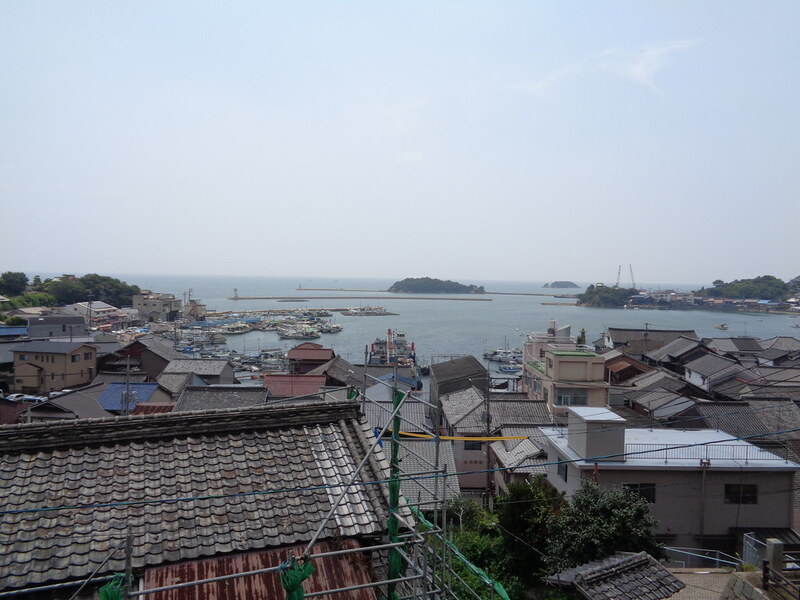 After the Yamato Museum, we went up to a hill overlooking the harbor, and could see all the naval construction & repair facilities, and a bit of the Maritime Self-Defense Forces base… A lot of the prewar brick architecture – warehouses, and the main command headquarters – still survive today. Definitely lends to the flavor of the city, given that in so many Japanese cities the prewar buildings generally don’t survive. 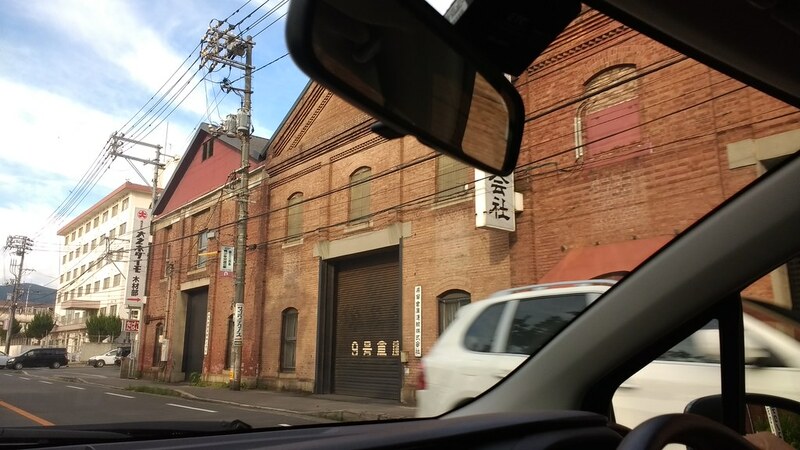 Red brick warehouses in Kure. 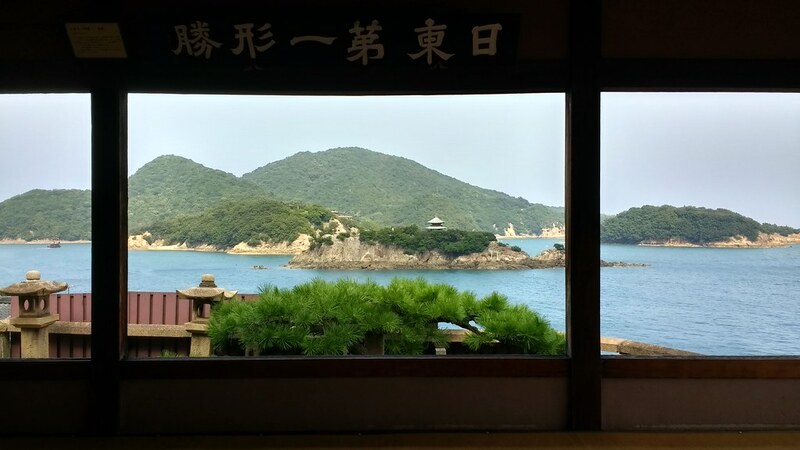 The view from the Kanchôrô (“Tide Viewing Tower”) in Kamagari. After much delay, I finally in my second-to-last week in Japan took a bus down to Hiroshima and visited some of the small Inland Sea port towns that envoys from the Ryukyu Kingdom passed through on their way to and from Edo (the seat of the Tokugawa shogun). This was my second time in Hiroshima, having visited very briefly once way back in 2003. At that time, I spent just one day seeing all the most major sights – the Peace Park, the Peace Memorial Museum, the castle – and another day on Miyajima. 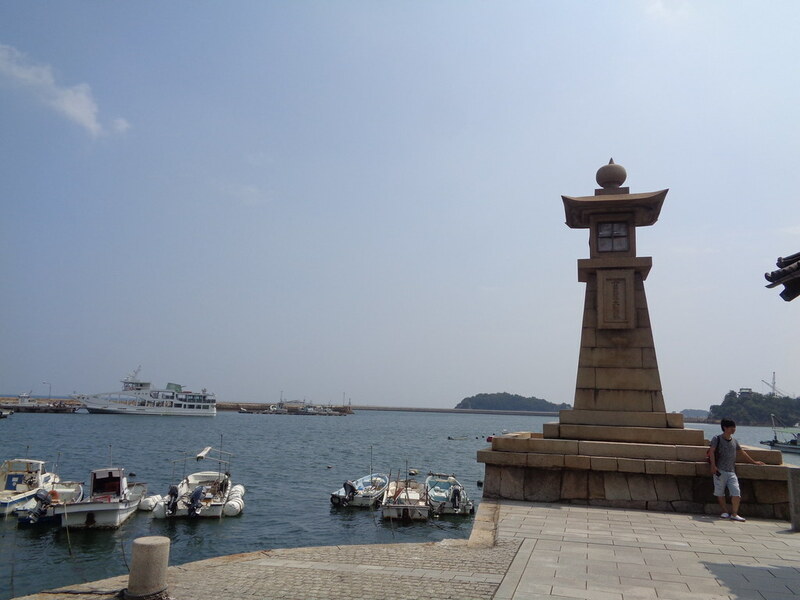 This time, I would skip Hiroshima City almost entirely, and spend several days in Kure City, and in some small island port towns today administered as part of Kure and Fukuyama cities. It was really something to get out and visit these towns after reading about them, and thinking about visiting, for so long. 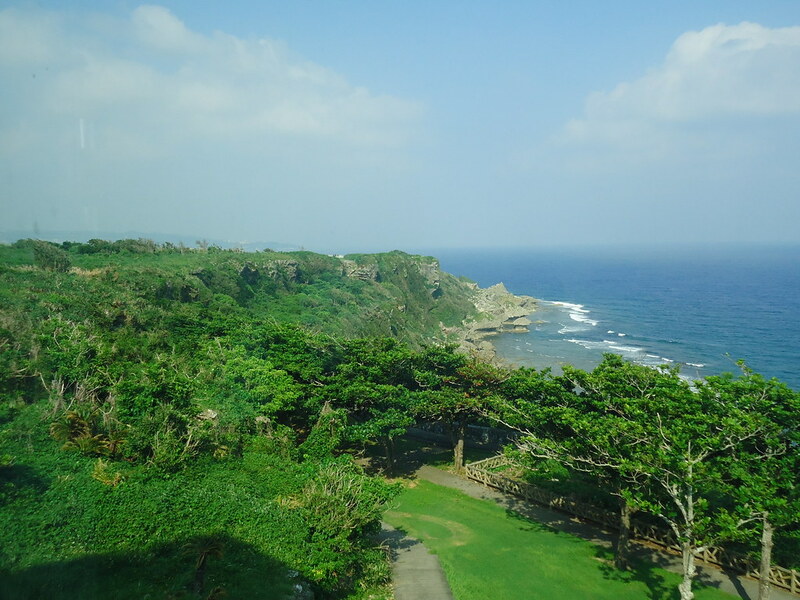 It was really something just to get out of Tokyo – I hadn’t realized it, but actually the entire year, while I did get around Okinawa a fair bit, actually I hadn’t gone anywhere at all the entire year outside of Okinawa and Tokyo (and just a very little bit of Yokohama and Chiba, which don’t really count). This whole notion of having “a whole year” and that I might visit Kyoto and Osaka, and Kagoshima and Fukuoka, and Sendai, and Toyohashi, none of that came to pass. But I did at least make it out to Hiroshima. When embassies from the Korean court arrived at Kamagari, they were received quite warmly, with red carpets laid down along the harbor’s main walking paths, allowing the Koreans to travel all the way to their lodgings without setting foot on the dirt roads. 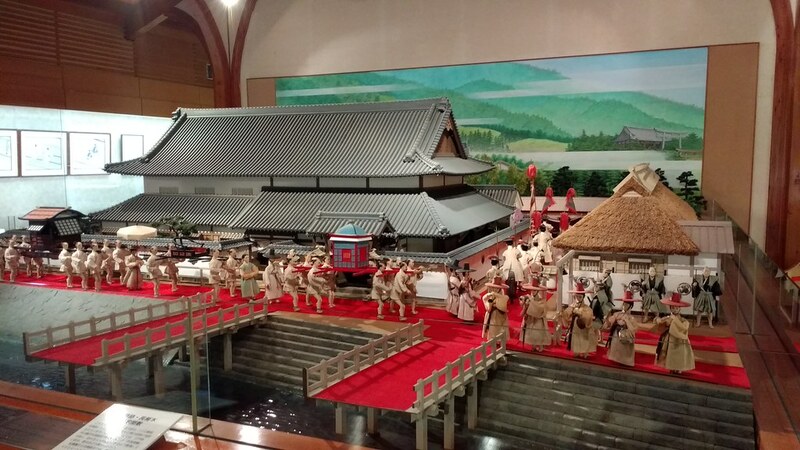 Model on display at the Gochisô Ichibankan museum. In the Edo period (1600-1868), diplomatic missions from the Ryukyu Kingdom, passing through the Inland Sea on their way to Edo, stopped at Inland Sea port towns such as Tsuwaji, Kamagari, Mitarai, Tomonoura, and Onomochi, as did missions from Korea and the Dutch East India Company, and other traveling elites – such as Imperial envoys and provincial lords (daimyo). These towns are super small and provincial today, subsisting as far as I can imagine on just tourism, fishing, and I guess some very small-scale workshop/factory sort of operations. Back in the Edo period, too, these weren’t very large towns. But they were significant, notable, and in a number of these towns, historic buildings or entire historic sections, have been maintained or restored. It’s always wonderful to get out and see another part of Japan. I really wish I had done more of this. See a different side of things. Driving around Hiroshima prefecture, we saw roadside highway rest stops – something you don’t see if you’re always just flying or taking the train – and what sort of local goods and products they have. Hiroshima Carp (baseball) merchandise. Setouchi lemon flavored everything. Andersen – a Danish-themed, Hiroshima-based, bakery chain. Not to mention the souvenirs (omiyage). Momiji manju (little red bean cakes in the shape of maple leaves) are a major Hiroshima thing, apparently. The gangi stone steps at Kamagari. But, returning to the port towns. I arrived on August 6, the second time I’ve gone to Hiroshima and it accidentally turned out to be the anniversary of the bombing. We had planned to spend the day in Hiroshima City, therefore, and see some of the memorial/anniversary events. 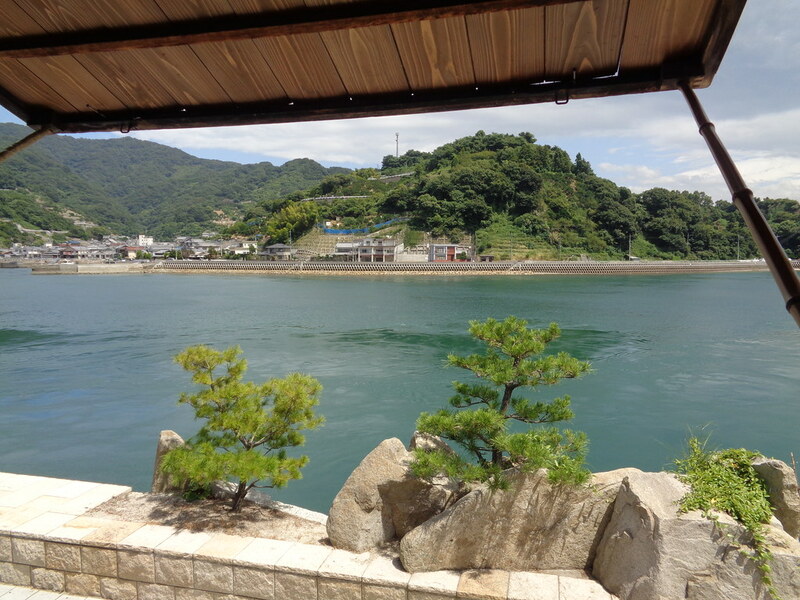 But, as there was a typhoon expected the following day, we instead headed out straight-ahead, to Shimo-Kamagari. Strangely, Kamagari didn’t come up as much in my reading as much as some of the other towns – in fact, it wasn’t on my radar at all. But I am so glad we went. 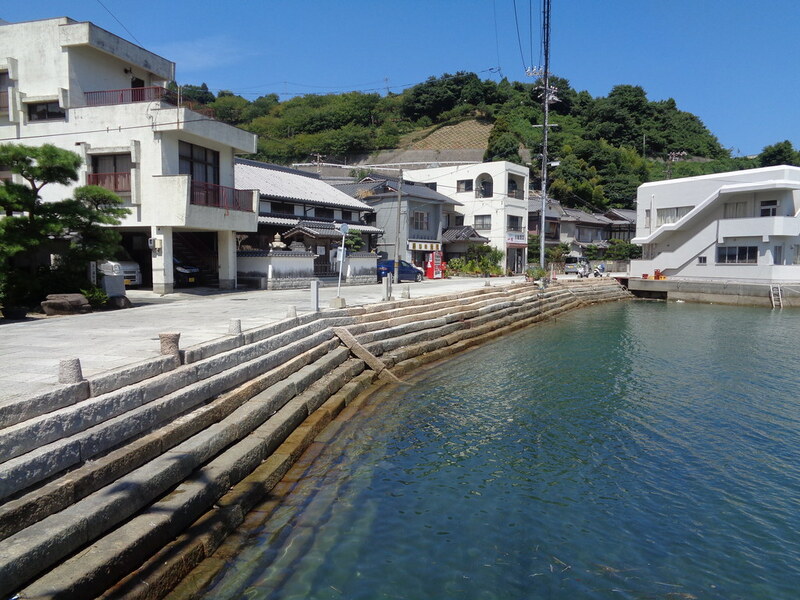 At what I suppose we could call the center of town, a set of stone steps (gangi 雁木) extend up out of the water – this, in place of wooden docks. And immediately across the street, the former honjin (special inn for visiting elites), today operating as a small art museum. A man was standing in the parking lot, working on a brightly-colored traditional-looking wooden rowboat, and when we asked him about the boat, it turned out he’s a volunteer tour guide in the town, and he kindly took of his time to really show us around. As he explained, the town would prepare for welcoming Korean missions by erecting temporary wooden piers extending out over the water, and red carpets would be laid down all along the main walking paths, so that when the Koreans came, they could walk on these red carpets – never touching the dirt – all the way from the boats to the lodgings. 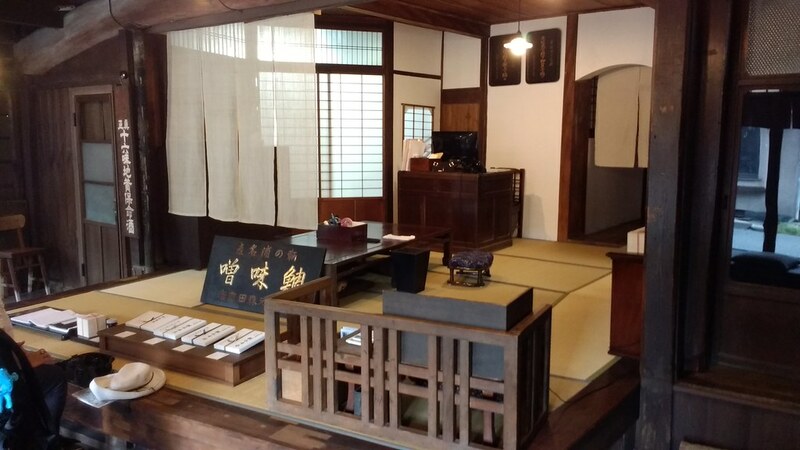 The gentleman, whose name was Funada-san, then took us down a short walking path running past the honjin, and then a left and a right, and up a short set of stairs, to where the ue-no-chaya, or “upper teahouse,” used to stand. Along with the honjin and the “lower teahouse”, this was one of the chief lodgings for Korean, Ryukyuan, and other visiting elites. 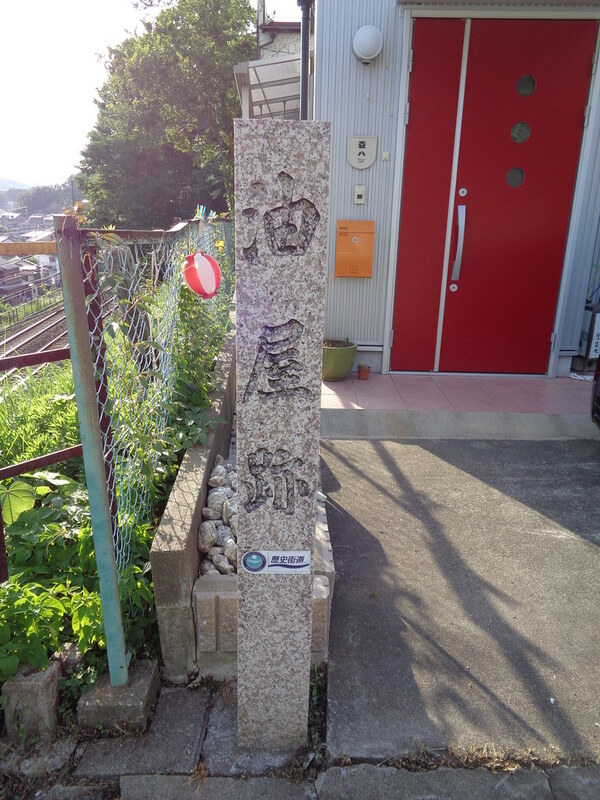 Today, a stone marker stands on the spot, saying simply “former site of the lodgings for the Korean missions,” as if Ryukyuans and others never stayed there? 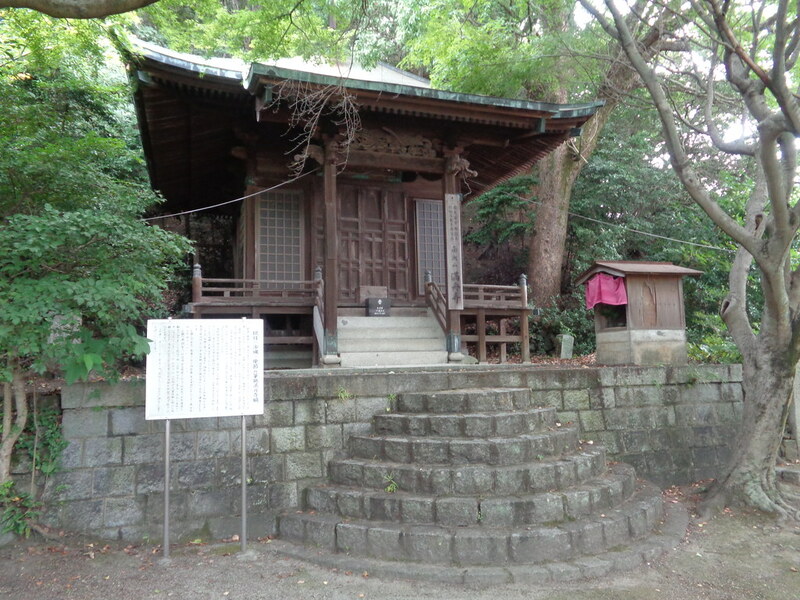 He then also showed us a nearby Buddhist temple, and Shinto shrine. I could have read this in a book – that the Koreans were welcomed in such a fashion. And maybe the book might have even had maps or diagrams. But actually seeing it in person, and being shown around, was really another level. This was the only time during the week that we really got such a tour, but still it was really great to have my friend there to initiate conversation with people, ask things, and get such a response – I wonder whether I would have asked, or not, and what sort of response I might have gotten; whether he would have given me a tour had I been alone. One of the main museum buildings at the Shôtôen, which used to serve as lodgings for foreign embassies. The two of us then made our way to the Shôtôen and Gochisô Ichibankan (Shôtô Gardens and Reception Number One Hall), another set of reception halls, located just a short ways down the shore, which are today maintained as museums. Sadly, we ran out of time and didn’t get to see the whole thing, but we saw the most important part: the museum of the Korean embassies. The rest of the buildings were mostly pottery displays and so forth. One whole building of lanterns, supposedly, though I didn’t get to see that. 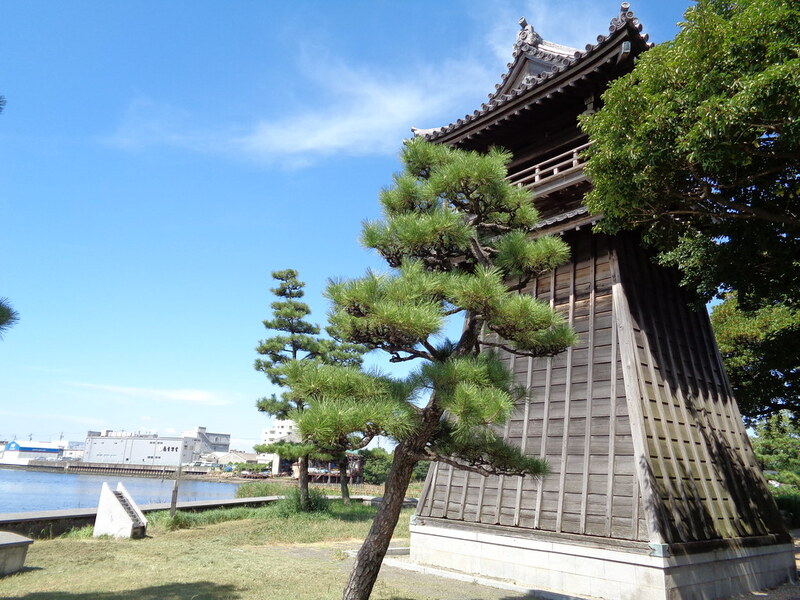 But, on the second floor, which we did get to see, the Kanchôrô, or “Tide-Watching Tower,” a small space for just sitting and enjoying the view – a gorgeous view of the Inland Sea, as the tides flow in and out, and of one of the other islands just across the way. The Korean embassies museum was small, but pretty good. They spend a disproportionate amount of space and attention on the food served to the embassies, and nearly no time on the aspects of “reception” I’d be more interested in: banners, curtains, processions, further details about these red carpets and so forth; not to mention the comparative information on how the Ryukyuan missions were received by contrast. But, so it goes. Sadly, they didn’t allow photos inside the museum, so I could only do what little I could do to read some of the labels and jot down some notes. But, it’s a nice museum. A few procession scrolls on display, including one really interesting one of Korean boats passing through the Inland Sea – an interesting slightly sketchy sort of painting style, perhaps a local or amateur painter, quite skilled but not professional, sketching rather than truly fully illustrating out the procession in a finished-looking way. And there was a model of the reception, with the honjin and the red carpets and little dolls of the Korean envoys marching into the town, as well as a larger model of their ship. Opening section of a 1748 handscroll painting depicting the Korean missions as they sailed through the Inland Sea. 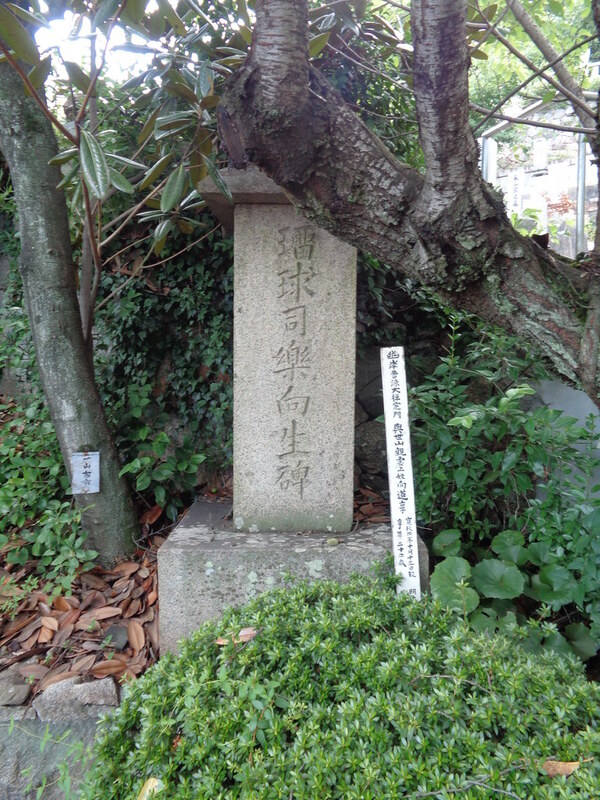 Collection of the Gochisô Ichibankan, in Kamagari. It was starting to rain, and it was already getting a little late in the day, so we hopped back in the car and headed to Mitarai, another notable port town two or three islands over. More on that in the next blog post. Yesterday, June 23, marked the annual Okinawan observance of Irei no Hi 慰霊の日, an official holiday in memory of those many, many Okinawans and others killed in the Battle of Okinawa. 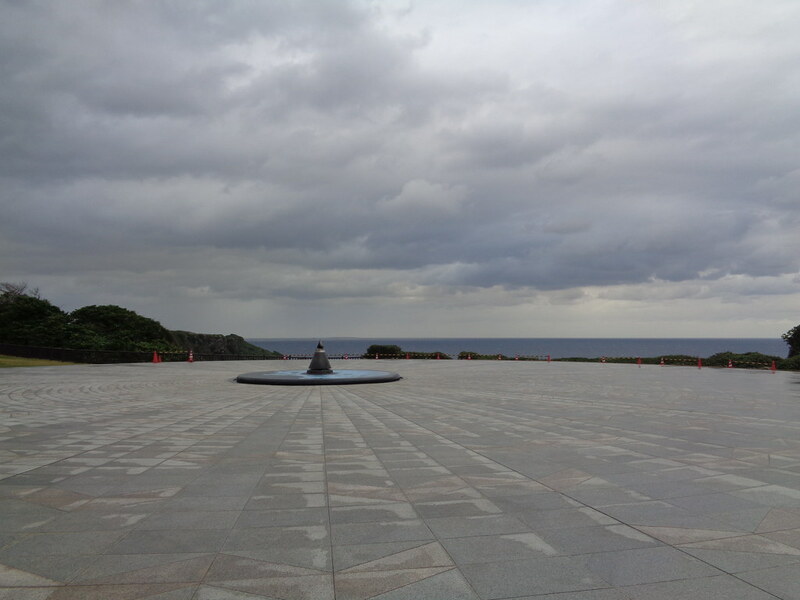 I figured this an opportune time to finally post something about the Okinawa Peace Memorial Park & Museum (Okinawa Heiwa Kinen Kôen / Shiryôkan 沖縄県平和祈念公園・資料館), which I visited several times during my time in Okinawa this past year. I took extensive notes the last time I was there, and went back to my notes to build this post, but found that what I had written was quite descriptive, and strangely I’ve found myself kind of struggling to write something more interpretive about the museum. I guess it’s been too long since I’ve been in a Museum Studies frame of mind. 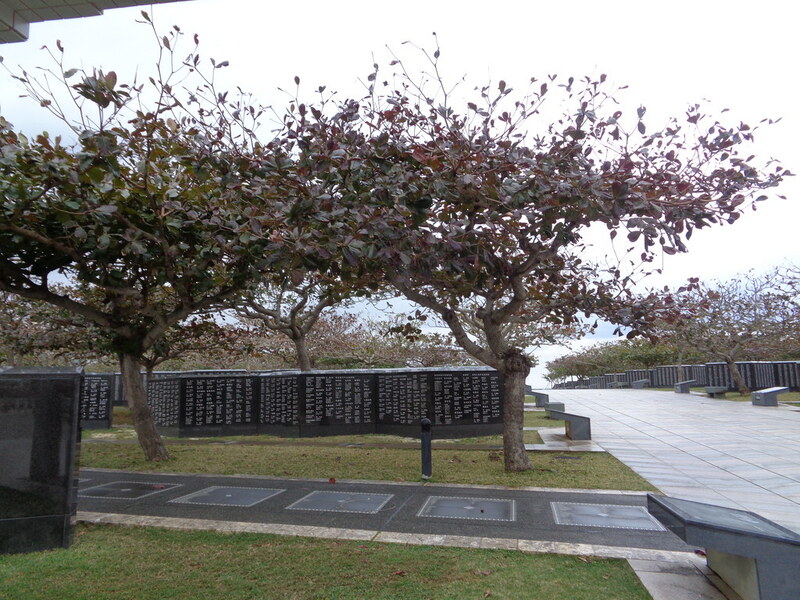 The Okinawa Peace Memorial Museum is located within the Okinawa Peace Memorial Park at Mabuni, near the southern tip of Okinawa Island. In many ways it reminds me of the memorial park at Hiroshima, and also of Holocaust Museums I have visited in various cities around the United States, and of Yad Vashem, the chief Holocaust memorial site in Jerusalem. The park itself is quite extensive, and includes a number of different memorials. 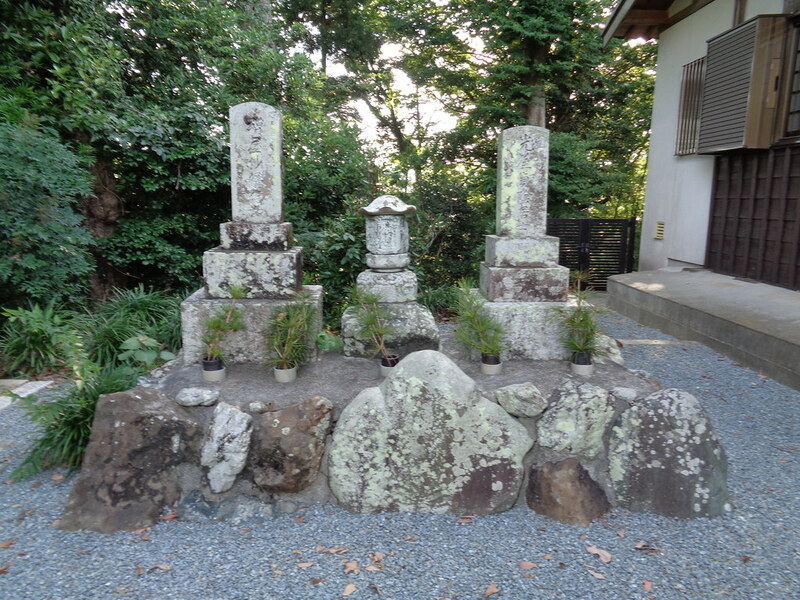 The main one is a series of rows of black stone slabs, inscribed with the names of all those killed in the Battle, whether they be Okinawan, Japanese, Korean, Taiwanese, or American; the slabs are organized in rows, fanning out from an eternal flame, known as the Cornerstone of Peace (Heiwa no ishiji, 平和の礎), and beyond that, the sea. The whole arrangement creates the impression of waves, waves of peace, emanating out from the Cornerstone, emanating out from Okinawa, into the world. I must admit, when I first read that this was the intention of the design, and first truly felt that image in my mind, in my heart, I started crying. Far too many people are unaware of Okinawa’s story, and of the lessons it has to teach; far too many people are as of yet untouched by those waves of peace, emanating out from Okinawa, trying desperately to bring peace to the world. As for the museum itself, it begins with a very detailed account of the 1930s to 40s, the economic and political situation in Japan, in Okinawa, and the world, setting the stage, described in a way that strikes me as “objective” in voice, or at the very least, with a detached sort of perspective. And by this I mean that I did not sense within the phrasing of the labels, or the organization of this first part of the exhibit, blatant lionizing or villainizing; I did not sense a blatantly, boldly, pro- or anti-Japan perspective. 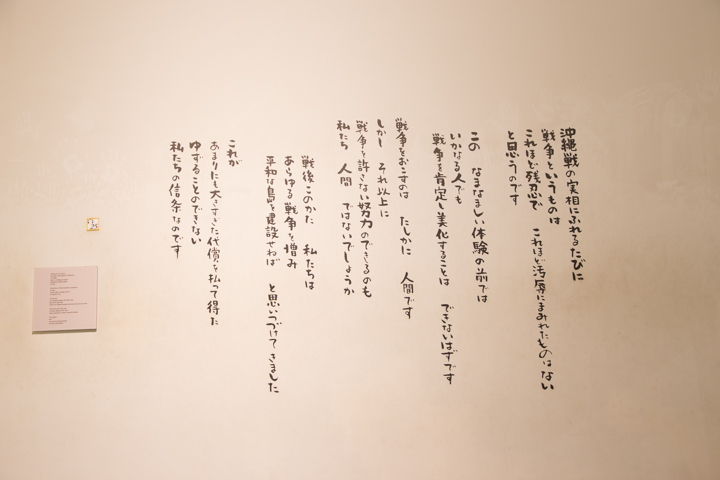 Rather the exhibit basically just explains what happened, what events took place, what decisions were made; it provides the background situation amidst which Japan made the decisions it did – in terms of both domestic and international considerations, and so forth. All of this set-up is given in a series of labels, displays, objects, short videos, packed into the displays around the edge of the first, circular, room. I think this is a really good approach for a Memorial Museum. Maybe I’m too biased (in favor of the Okinawans) and thus was blind to the biases in the exhibition, but, really I think it took a rather objective or distanced stance. And this is a smart move because, unlike at so many other museums – e.g. the Hiroshima Memorial Museum, the Yûshûkan at Yasukuni Shrine, the Meiji Memorial Picture Gallery which I’ll post about soon – where the bias is blatant and obvious, thus making the whole thing all too easy to dismiss out of hand, here the Museum is telling you, in cold hard facts, this is what happened. This is real, this is true. It’s not being blown out of proportion or taken out of context. In truth, I think there’s a lot to be taken away from this first room, alone. I’m not as expert on this period as some of my colleagues, and I am not expertly familiar with all the various nuances and complexities of the different narratives, different versions, different approaches, to understanding Japanese imperialism, but from what I have seen, I really think this is about the best. It presents the context, the pressures upon the Japanese government (both real and perceived), the reasons the government did what it did – even if those choices were, to be sure, horrible and worthy of being condemned – thus presenting the Japanese certainly as oppressors, aggressors, but not as irrational monsters, while also not going too far in the other direction, portraying the Japanese as merely victims of world circumstance. Imperial Japan had real reasons for choosing the path that it did – they were regular human beings, not monsters – but still, the path they chose was one of violence and oppression. We must understand the circumstances, the choices made, and the repercussions, the outcomes, in order to learn the lessons of the past, and to be able to work more truly towards building a better future, a better path, such that similar events should never happen again. Because I found this exhibit so well done, I was quite frustrated on my first and second visits to the museum that they don’t allow photographs. And, as you’d expect if you know me, I’m still quite frustrated about that. But, on my third visit I found, what I had not seen previously, a museum catalog book of the permanent exhibition for sale, which essentially contains much of that same content, in easily purchasable and keepable form, for less than 2000 yen. Now that I own this book, I very much hope that I find the time at some point to read it all and write it all down – in English – into a form I can use for lectures, whether it be World History, Japanese History, or East Asian History. Another way the museum did an excellent job in making their story more accessible, more meaningful, is that they don’t really limit it to the Okinawan case, or the Okinawan perspective. Yes, the succeeding rooms are specifically about Okinawa, but the set-up, this first room of 1930s-40s Japanese and world historical context, is broad enough, general enough, that it really works as a quality account applicable and useful in general, for anyone discussing Imperial Japan & the Asia-Pacific War – perhaps even the best account I’ve yet seen at all. Hopefully, it speaks to visitors from all around the world, and not only to those interested in the Okinawan case, or the Okinawan position. Hopefully, by telling the story this way, it should be able to successfully convey the message of the dangers of militarism, of ultranationalism, in general, no matter who is doing it (not just the Japanese). 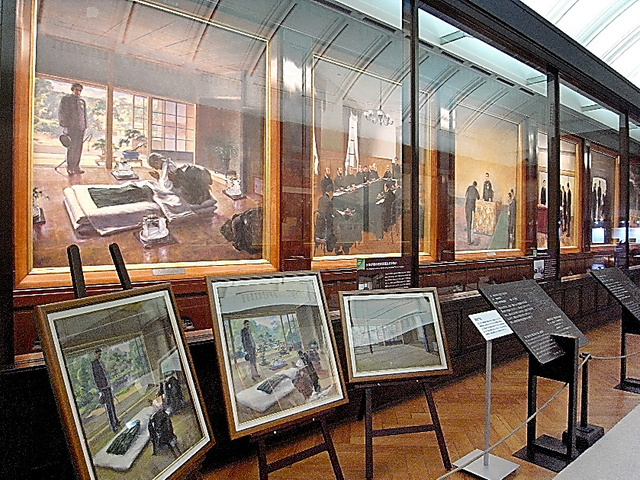 A view of the first gallery, courtesy OkinawaClip.com. After making one’s way through this detailed and well-presented background behind the origins of Japanese ultranationalism, militarism, and imperialism, a short video in the center of the first room summarizes the progression of the war itself, from one battle to the next. 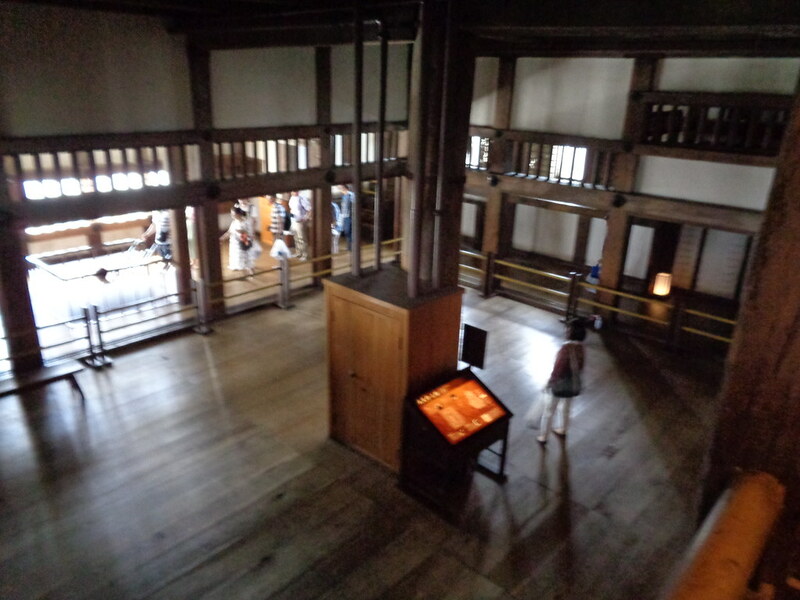 To the side of this room is a special exhibit corner, which at that time had a small exhibit on the Japanese colonies in Nanyô/Micronesia. And also on comparing history textbooks not only between US, Japan, China, Korea, but also with Palau, Malaysia, and elsewhere. Really interesting to see – not something we normally get exposed to. The next room is set up to evoke the atmosphere of the so-called Typhoon of Steel – that is, the Battle of Okinawa. It is dark, with steel girders and concrete protruding here and there. A large 3D map of Okinawa sits in the middle of the room, with various things about the battle marked out on it. And hanging above the map is a large video screen, on which plays a short video about the Battle. This, for me, was probably one of the centerpieces of the entire exhibition. The museum provides the background, the set-up, in the previous room, and the aftermath in the following rooms. Here, it provides the story of the event itself: what happened to Okinawa that this museum as a whole (and the memorial park outside) is memorializing – what suffering, what death and destruction, took place here. It brings you in, it makes you understand. It makes you feel, the death and destruction, the sadness. Then, we move into the following room, and the museum shifts dramatically, from historical narrative, to a memorial mode. I suppose, sitting and writing this out now, that this is still historical narrative, but it’s shifting from a “big picture” mode of the history of politics, economics, and war, to a far more personal level. We see large photos of individual people and individual scenes of death and destruction, and next to it, a walk-in reconstruction of the gama, the caves in which people hid during the Battle. Mannequins are set up to show how people suffered and survived in the caves, and committed some truly horrific acts in order to survive, including killing crying babies so their screams wouldn’t alert soldiers outside to the presence of the civilians hiding inside the cave. The Testimonials Room at the museum. Image again thanks to OkinawaClip.com. The next room of the museum is a Testimonials room. I don’t know if it’s actually more brightly lit than the previous rooms, but it gives a feeling of starkness, whiteness. 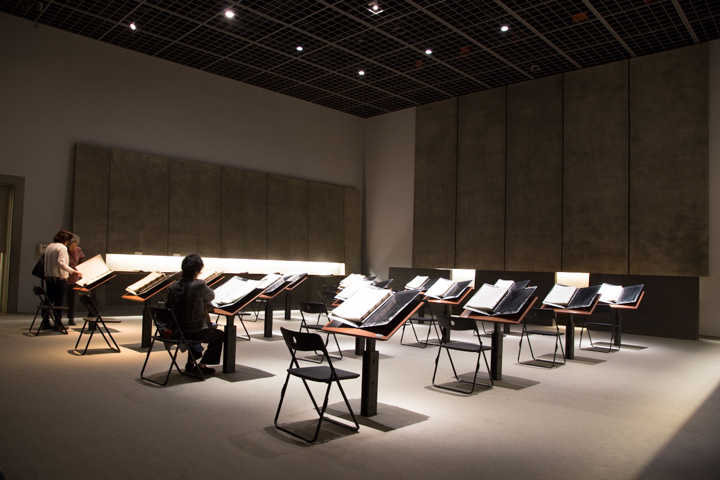 Desks are arranged in perfect rows, and books/binders provide numerous first-hand accounts of people’s experiences during the battle. I only read a very few, but they were horrific. People who were just small children at the time, witnessing their siblings or parents killed right in front of them, whether by soldiers, or by suicide. People who hid in caves and were so terrified to come out, for fear of what might happen to them. Reading these individual stories, of individual people, often young children, who had lived such (relatively) normal lives up until then, and who we can imagine might have had such bright futures ahead of them, thrown into this world of suffering and death, and all because of war, because of militarism and imperialism and ultranationalism, and in the specific case of Okinawa, because two world superpowers based in capitals thousands of miles away decided that their tiny island should be the place to battle it out. A bank of small viewing rooms sits on the back side of this Testimonial hall. I don’t think I’ve ever stopped to sit and watch any of the the video testimonials, though I really should. Isn’t it we human beings who must also prevent wars? Long yearning to create a peaceful island. From here on, we are led through a chronological narrative of Okinawa’s post-war history. The Testimony room is followed by refugee camps 収容所. Dark wood poles and canvas tent sections overhead evoke the feeling of being in such a camp. Along with laundry hung on barbed wire fences. This is followed by a section made up to look like a 1950s commercial shopping street, with barbershop, bars, nightclub, tailor shop… And then, as we enter the next section, it turns to barbed wire fencing, with a mannequin in US military uniform looking as though he is asking for your ID. 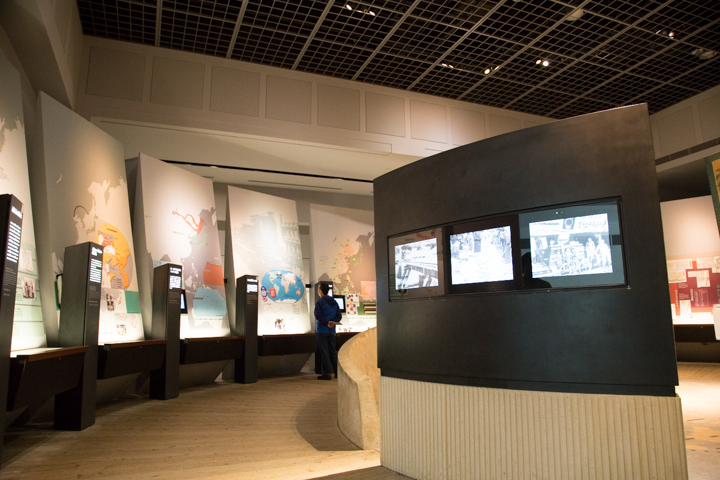 Exhibits include detailed descriptions of the progress of developments in politics, economics, protests, and so forth, from the US Occupation of Okinawa, to the eventual “freedom” from Occupation, and rejoining Japan in 1972, up to the present, as the military presence and protests against it continue. I made sure to take extensive notes on my last visit to this museum. While I had known about the prewar and wartime history to a certain extent, I had very little sense of the date-by-date chronological developments of the post-war period. Seeing it spelled out was really quite interesting, moving, and impactful. There’s just so much here, so many twists and turns, that add such depth to the story. We learn about the refugee camps and the evolution of semblances of Okinawan self-governance from the 1950s through the 1970s to today; how the US Occupation ended so much earlier in the Amami Islands; the visit of the head of the ACLU to Okinawa; the way the military forced people into leasing out their land for exceptionally low, unfair, rates; the way bayonets and bulldozers were used to physically remove people from their land; and details of how the resistance and protest and independence movements rose and fell; connections to Communism and to US anti-Communist crackdowns; and the progress of developments in how the US Occupation authorities dealt with political opposition, and how they deal with crimes and scandals today. I know I haven’t said much in this post of an analytical or interpretive nature. There are formal Museum Studies academic journal articles, and exhibit reviews, out there, I’m sure, which articulate far better what I wish I could here. But, as much as I wish I knew how to articulate all that myself, I think that for now, I’ll just leave it by saying that this is truly an excellent Memorial Museum, an excellent history museum, and while I know it’s a bit out of the way, I really wish more people – I wish everyone – would go and visit the Okinawa Peace Memorial Museum. This is not just a niche story relevant only to those with interest in Okinawa; nor is it in any way what you might expect from a local, out-of-the-way, provincial museum. 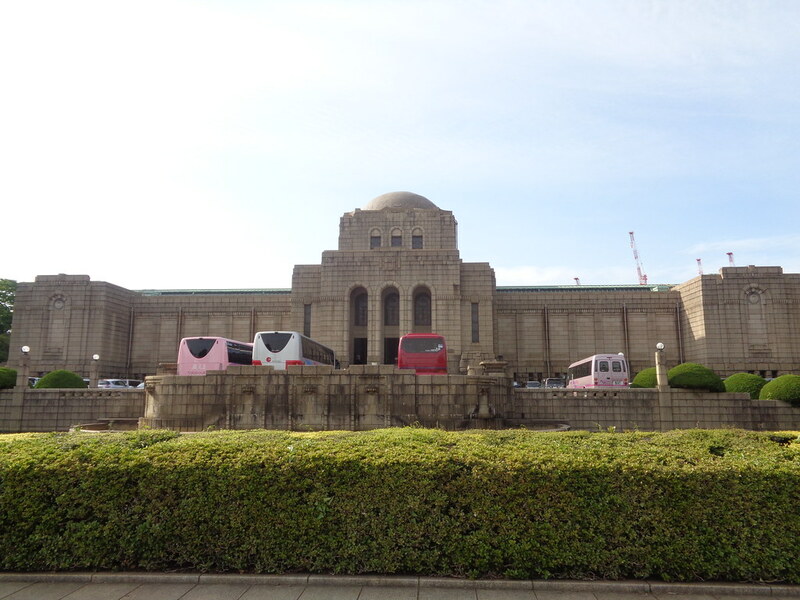 Truly, this is a top-notch, world-class World War II Memorial Museum. I think the lessons it has to teach are of immense importance for everyone around the world, and that this museum does an excellent job of conveying those lessons (including by making the exhibits quite accessible, with labels and video subtitles in multiple languages). On this Irei no Hi, let us take a moment to think, to remember, and to sympathize. Let us picture in our minds waves of peace, flowing out from Okinawa, waves of people trying desperately to reach out, and to wash over the whole world, such that what happened in Okinawa, and tragically in so many other places all around the world, might someday truly cease to ever take place again. The Mabuni cliffs, just outside the museum, where in 1945 a great many people, pressed down to the southern end of the island trying to flee the violence, had nowhere left to go, and threw themselves off the cliffs, to their deaths. All exterior photos my own. 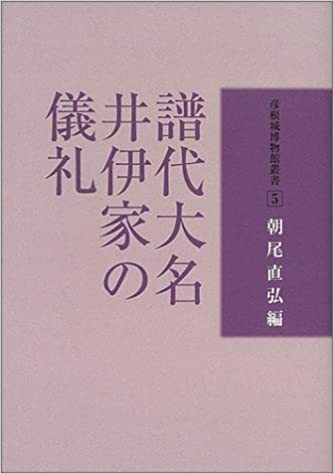 Reading through a journal article by Prof. Asô Shin’ichi (Okinawa Geidai) on samurai gift-giving customs, and how that relates to Ryûkyû’s gifts to the Shimazu and to the shogunate, I found reference to this book edited by Asao Naohiro 朝尾直弘, which just somehow grabbed my attention. 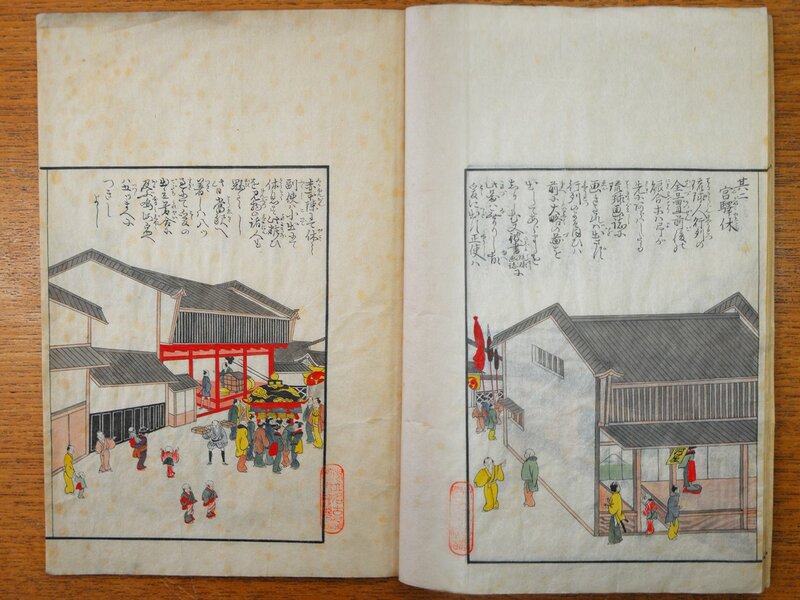 Entitled Fudai daimyô Ii ke no girei 譜代大名井伊家の儀礼, or roughly “Ceremonies of the Ii clan of Hikone domain,” it’s one of a series of books put out by the Hikone Castle Museum, using the Ii Family Documents 彦根藩井伊家文書 and other sources to explore a more extensive, detailed, complex understanding of the history of the Ii clan of Hikone domain, and by extension of aspects of early modern (i.e. 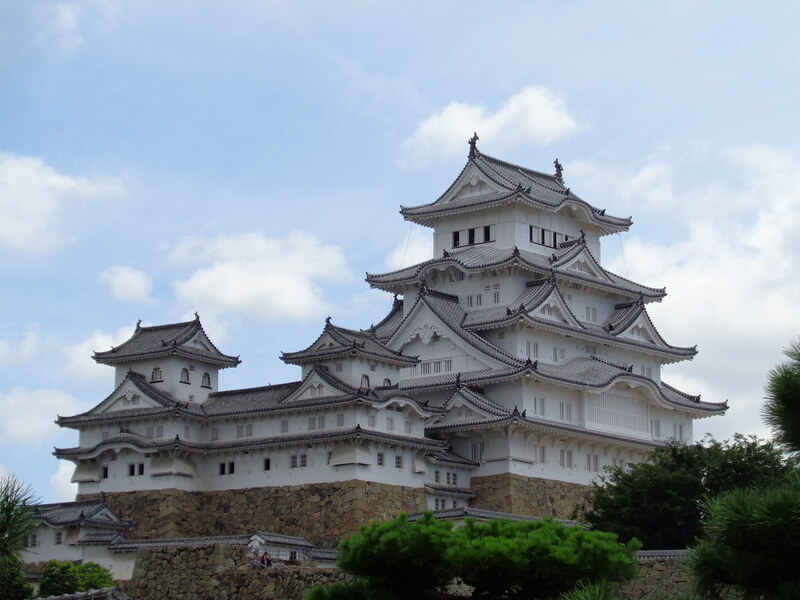 Tokugawa period) Japanese history more broadly. Though it normally goes for 6000 yen (roughly US$60), I was fortunate to find a copy online for the far more reasonable 2000 yen. Thank you, Amazon.jp. Even just on the face of it, this style of book, this approach, really appeals to me. I love the idea of using local histories in my own research. The scholars featured in this volume worked with the Hikone Castle Museum to produce something that doesn’t just take the Ii family as some kind of convenient case study, in order to examine something broader, more removed, more theoretical or abstract. Rather, it takes the Ii family, their records, their local domainal history, as something to be explored as a topic worthy of interest in and of itself. And so, while I admittedly am using them as a convenient example, a convenient resource, for my own project, nevertheless I find something really appealing about the idea of employing such research. I will also be reading, and citing, books like Yamamoto Hirofumi’s Sankin kôtai and numerous others which are more typical academic books, drawing upon whatever resources from here and there in order to build up an argument, or simply a description or narrative, of something much broader (in Yamamoto’s case, the “alternate attendance” or sankin kôtai system, as practiced not by any one domain, but by all of them, across the archipelago). But, reading this Hikone volume and drawing upon research that’s focused in on a particular set of documents from a genuine interest in the history of that particular family and their domain, makes me happy. 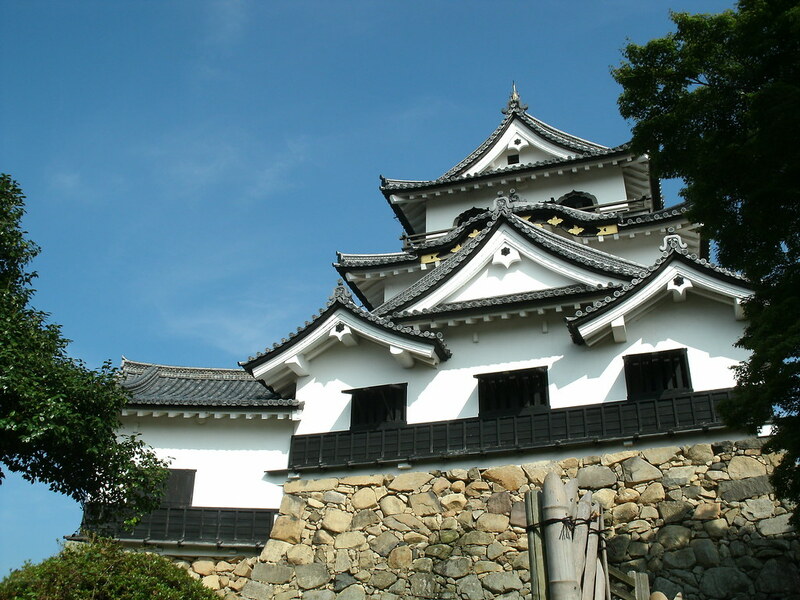 A section of Hikone castle, home to the lords of the Ii clan. Photo my own. And, actually delving into the book, I find that at least some of the chapters – those by Okazaki Hironori 岡崎寛徳 – follow a really interesting format. Okazaki’s chapters, like all the others, like most chapters in most academic books, each address a particular aspect or sub-topic, and form an argument, or a narrative, about them, but they do so while quoting heavily from primary source documents – so heavily, in fact, that they serve as a pretty excellent resource for reading (and citing / quoting from) primary sources themselves. To put it another way, Okazaki’s chapters read not quite like a normal essay, but more like something in between a normal essay, and a set of introductions or explanations for primary sources. Roughly half the text in each of his chapters is just direct transcriptions of excerpts from the Ii Family Documents, and while there certainly is some narrative argument being made, at the same time he’s also just showing the reader a number of different aspects of the topic, as represented in primary sources. Here’s a letter from the domain to the shogunate asking for confirmation on which kinds of gifts they’re expected to give on which occasions (and in what numbers/volumes), and here’s the shogunate’s response (including permission to reduce the amount of gifts, in these financially difficult times [the 1720s]). And here’s Okazaki’s introduction to what the document is that he’s quoting from, and what this excerpt is going to show us; and then, here’s Okazaki’s summary of the key points of what the excerpt said. All in all, I just find he strikes an excellent balance – providing enough of the primary sources, on enough different aspects around the same topic or theme, and enough information surrounding them, to allow you to use them for your own research, your own interests, beyond just the narrow focus of his argument (that is, in contrast to more typical essays, which only quote just enough to make their argument, and only very strictly those sections which are relevant to their argument, leaving everything else out); and, at the same time, he’s doing so within a narrative or argumentative framework, thus providing so much more framing context, and explanation, than a lot of works I’ve seen that are more explicitly dedicated to only sharing transcriptions of the sources (with minimal framing material), leaving it totally up to the reader to make of it what one will, depending on the reader’s interests. 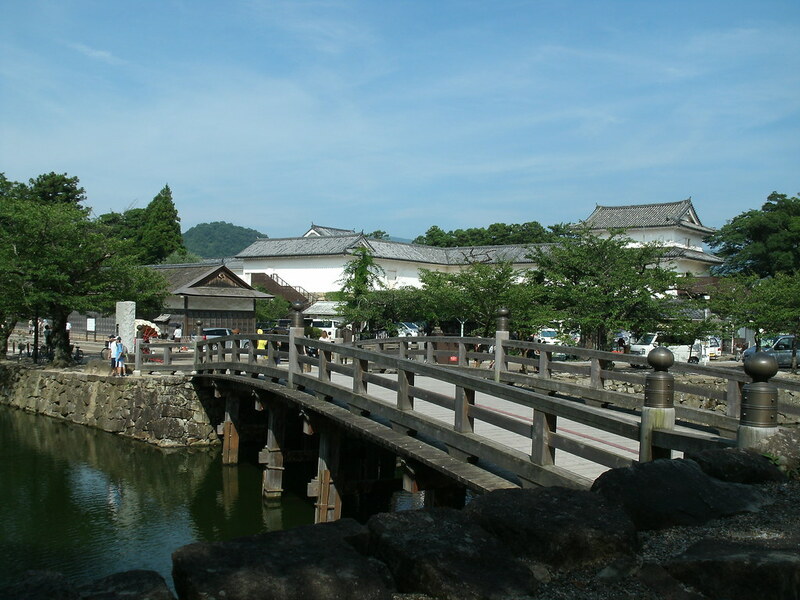 A bridge near the entrance to the Hikone castle complex. Photo my own. Let me see if I can give a more solid example. I think it’s easy to imagine a chapter or article from whatever book or journal that focuses solely on New Year’s audiences, for example, explaining out that one event, with maybe some minimal quoting here and there from primary sources, just enough to explain things out. And they of course would cite which sources they’re getting it from, and maybe they would explain a little bit what that document is, how it’s organized, why it contains the kinds of information that it does in the way that it does. I think it’s also easy to imagine a publication which just transcribes the entire primary source document, or significant sections of it, saying, essentially, “here it is. Use it as you will, for whatever aspects, whatever themes you may be researching,” without telling you much at all about the document itself – where it comes from; who wrote it, when, and why; which sections are about what; what new revelations might be learned from this document that aren’t found elsewhere; what to look for or to notice while reading; just the text itself, that’s it. Those are the two ends of the spectrum. Okazaki lies in between them. He spends a good paragraph or so introducing the Kôrei rinji gyôji tomechô 恒例臨時行事留帳, a 1736 document contained within the broader collection of Ii Family Documents – who wrote it, when, why, and what sort of stuff it contains. 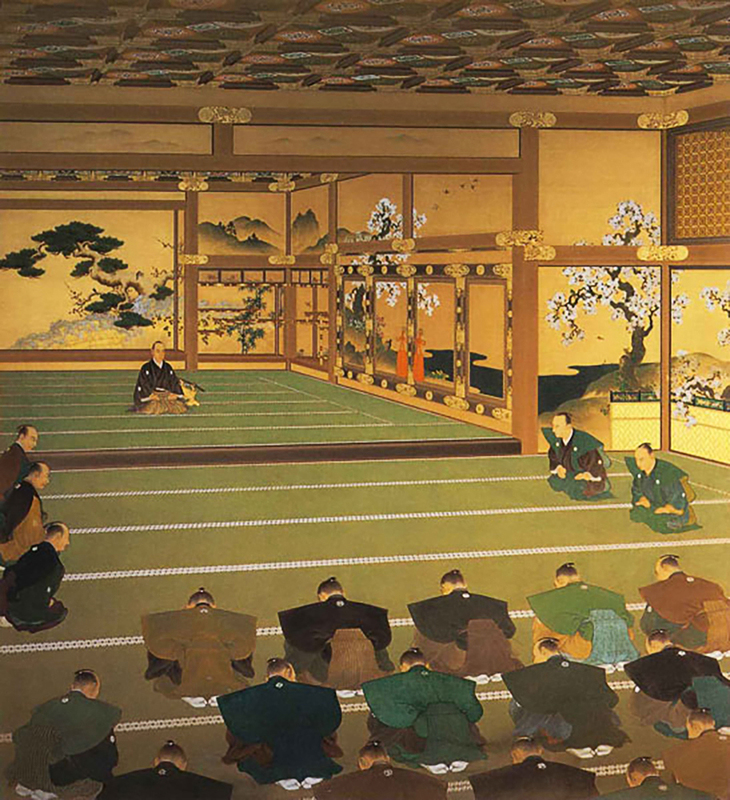 And then, while providing sizable excerpts from that text, sometimes a full paragraph, or even a full page or more at a time, he uses those excerpts to help show a full sampling of many of the different regular and irregular audiences & court rituals (at the shogun’s court, in Edo castle) in which the Ii participated. 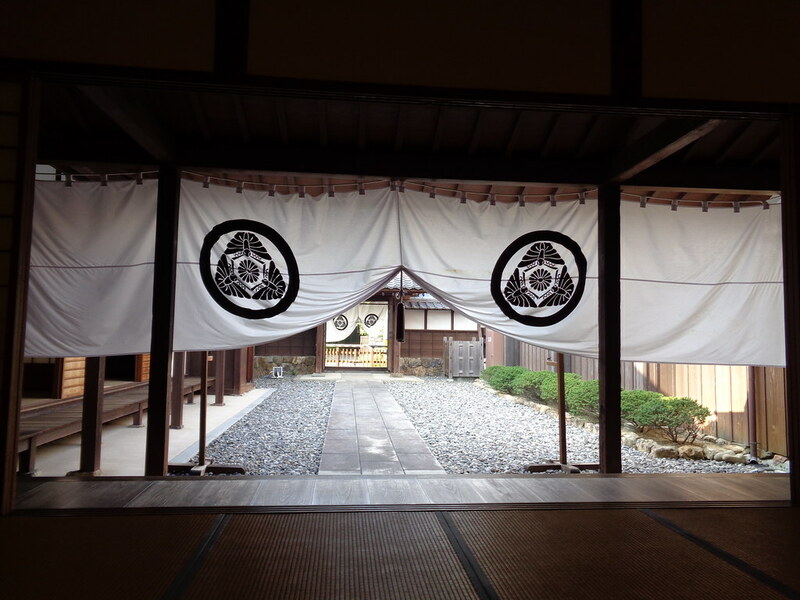 Here’s an excerpt explaining how for New Year’s, the Ii lord went up to the castle at X hour, sat in his designated waiting room (the Tamari-no-ma) in accordance with his rank, then moved to the Shiroshoin (one of several audience halls in the castle), and sat at such-and-such a spot, bowed X number of times, said such-and-such formal words, was told such-and-such by the rôjû (Elders) or by the Shogun himself, presented such-and-such gifts, bowed X number of times, then withdrew. And now here’s an excerpt showing how it was a bit different for the regular monthly audiences, for the “in-between” audiences (間之登城), for Girls’ Day and Boys’ Day and Chrysanthemum Festival. 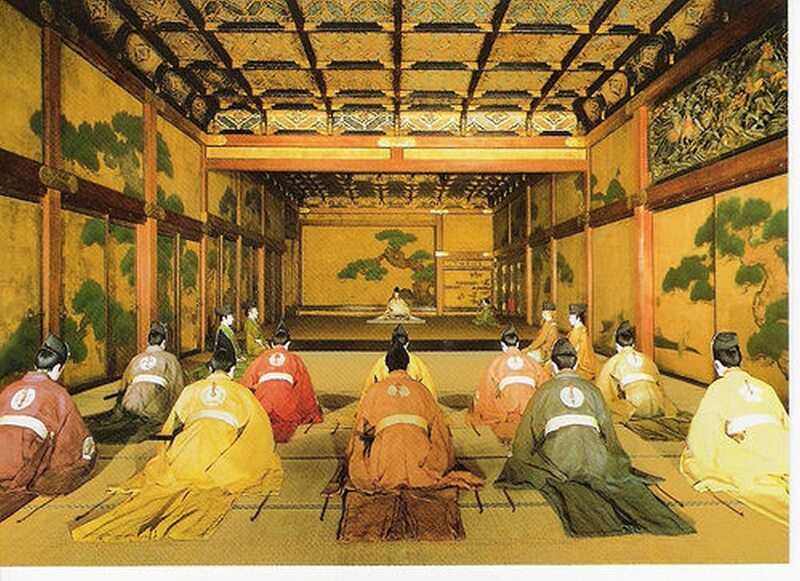 And here’s how it was for banquets following the shogun’s successful hunting expedition. And here’s how it was when the shogun decided to go horseback riding and to request (command, really) the various lords to come and attend just to watch him. Good-sized chunks of primary sources, presented not in-line just as quotes, just enough to make a single point within the course of an argument, but rather as good-sized chunks that are allowed to speak for themselves, surrounded by enough introduction, and summary, and explanation, to make them understandable and useful, and to present a broader narrative or argumentative description of a topic. Other chapters in this book, outside of those by Okazaki, seem at first glance to follow a more standard format. But, after eleven chapters addressing various aspects of the topic of “the Ii family and rituals,” the book ends with over 200 pages of more straightforwardly, more fully transcribed primary sources, along with maps and diagrams of several relevant buildings / rooms, and at the very end, charts of the family tree of the Ii family, a lengthy chart of where each Ii lord was on given dates (as they moved between Hikone, Edo, and other cities, on official and personal business), and a timeline of incidents and events relevant to the history of the family & of the domain. 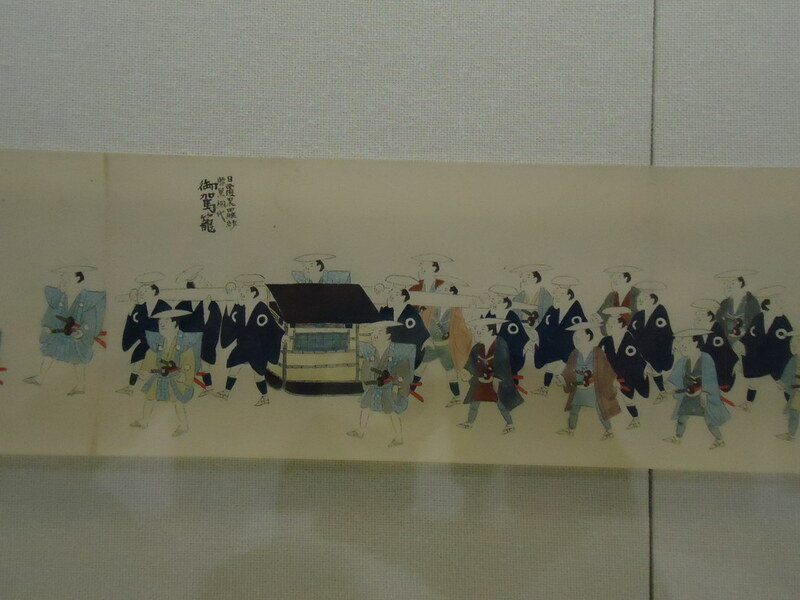 The sankin kôtai procession of the lord of Iyo-Matsuyama, as seen in one section of an 18th c. handscroll painting at the National Museum of Japanese History. Photo my own. One thing I do find frustrating, and a little disappointing, though, about this book is that like much other scholarship, it skips over explaining out the basic, general, foundational situation, and focuses overmuch on changes, exceptions, and complexities. 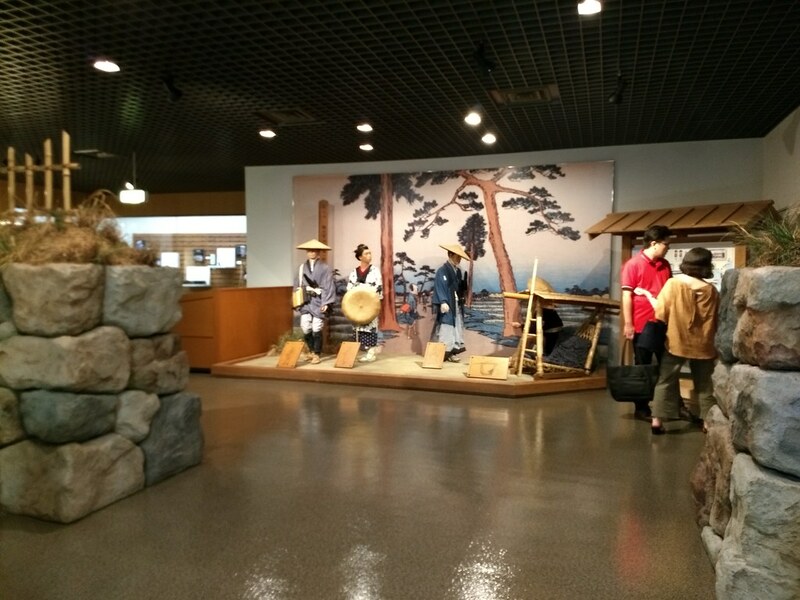 As wonderful as it is to learn, for example, about how the type and amount of gifts changed through negotiations in the 1720s at a time when both the shogunate and many domains were experiencing significant financial difficulties, I would love to first have a more general explanation of what types and amounts of gifts were typical, to begin with. And while it’s really interesting to learn about these various different hunting-related banquets and occasion of watching horseriding or Noh, I still don’t think I’ve ever yet come across a basic, step-by-step, description of just what normally, typically, happened when a lord arrived in Edo on sankin kôtai. This sort of thing is even more a problem in many of the other books and articles I have been reading, works which overwhelmingly employ extraordinary examples, rather than anything that might be representative of “standard” “typical” practices – for example, the journeys of either Tokugawa Iemitsu (in 1634) or of Tokugawa Iemochi (in 1863) to Kyoto, despite the fact that no shogun ever traveled to Kyoto for the 220+ intervening years; or the 1862 wedding of Imperial princess Kazu-no-miya into the shogunal family despite the fact that (a) this was probably one of only a very few Imperial-Tokugawa marriages, and (b) presumably by 1862 it’s late enough that practices would be quite different from whatever was typical in the 1600s or 1700s or even up into the 1830s or 1840s; or the shogunal succession ceremonies of Tokugawa Yoshimune, one of a handful of shoguns who were not direct relatives of their predecessors – why not use as your representative example records of the succession ceremony for a “normal” succession from father to son?